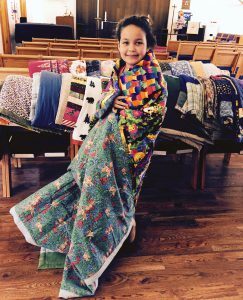 Once a month, from September-May, on the 3rd Wednesday from 9:00 a.m. to noon, members of Christ the King-Epiphany and other churches gather to sew quilts for Lutheran World Relief. These are very simply quilts using recycled fabric. The quilts are used for warmth and bedding for the poor around the world.